Polar Research and Policy Initiative Fellow Thomas Bishop interviews Olivier Walon, Project Director at Bouygues Bâtiment International, about Iqaluit International Airport due for completion in less than six months. Located in Iqaluit, the capital of the Canadian Province of Nunavut, and situated less than 200 miles from the Arctic Circle, an international airport is being built on the site of an older domestic one. 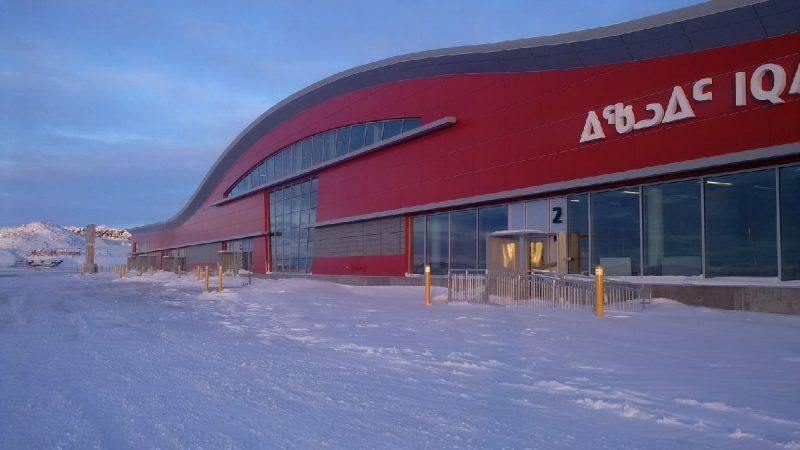 The new facility has been designed to deal with thousands of visitors in a day, serving Baffin Island as well as much of Canada’s Arctic, and it is being delivered by developer Bouygues. The airport will be eight times the size of the previous one, so it is an ambitious scheme and one that projects growing confidence about the Arctic economy, tourism and travel. That said, building the facility has not been without its challenges; ranging from the site being inaccessible for up to two months of the year due to the cold and snow, sourcing labour in a sparsely populated place and the logistics of construction when you can only depend on a two-month window to import a whole year’s worth of building materials by boat. Iqaluit’s new airport is expected to open before winter 2017. 1. 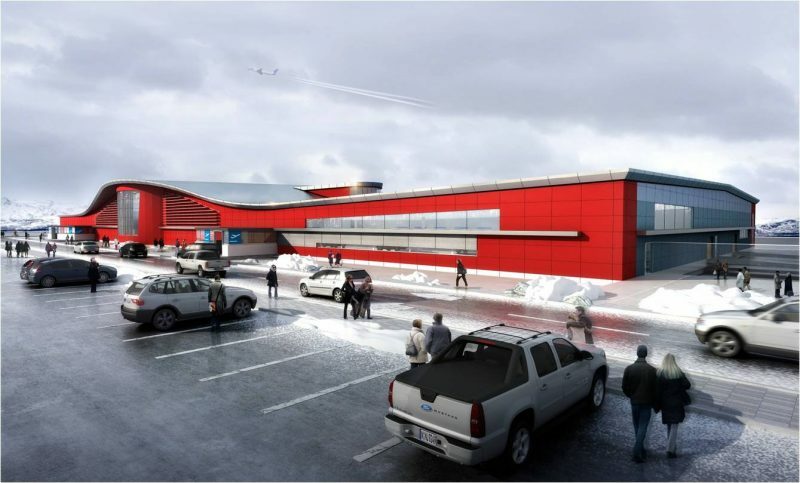 How does the Iqaluit Airport Improvement scheme fit within Bouygues’ portfolio? Well, Bouygues has plenty of experience and expertise in building international airports all around the globe, so it was first and foremost a natural fit. The Iqaluit Airport project, involving the renovation and expansion of an international airport in as remote a place as Iqaluit, Nunavut Territories, was a bold and beautiful challenge. However, the project also fits with what we do at Bouygues: working on all five continents, sometimes in extreme conditions, to deliver technically-challenging projects for our clients. A site progress photograph from February 2017 showing the new terminal building from the runway-side. 2. What in your opinion have been the most challenging aspects involved in delivering this particular scheme? There are so many that we could talk for hours, although the one foremost in my mind was that we have had to satisfy a lot of different parties. There were many parties involved in this project, including the Government of Nunavut, who are also the Airport Authority and the client on this project, then there are the financers and final users; who are not only the Service Provider, but also future tenants, airlines, and of course all the governmental agencies such as; CATSA (Airport Security), CBSA (Customs), Nav Canada and Transport Canada. In addition to that there are also the usual building inspectors and City of Iqaluit Council. Balancing all their demands was a careful business. After that, the Iqaluit Airport has also never stopped operating, receiving flights and travellers throughout the entire construction phase. While this is quite common for airport renovations, but it is still worth highlighting it as a challenge, as organising and arranging construction around a live airport in as cold a place as Iqaluit happened to be very formidable undertaking, especially for the building of the shell. 3. What features will the new airport have? When complete, Iqaluit airport will feature 450,000 square metres (4.3million ft2) of upgraded and heavier runway, more aprons for aeroplanes to park on, a new 10,000 square metre (100,000 ft2) terminal building that is eight times the size of the previous one, and a new combined-services building that will house the fire-fighting and support equipment. 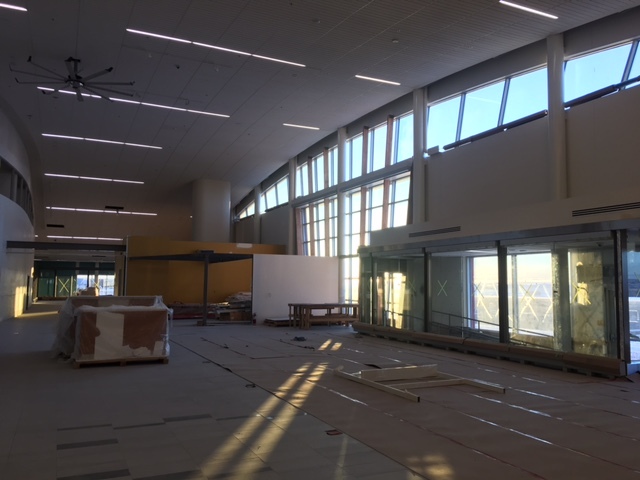 With all of the improvements the airport will be able to handle over 150,000 visitors a year, and with scope built-into the design to accommodate significantly more growth in future. 4. What other schemes have you personally worked on for the Bouygues Group? I have been involved with Bouygues for 15 years, working in different countries and on different continents. Most of the projects have been quite challenging for different reasons, due to technical complexities, remoteness, economic context and budgetary constraints, as well as with difficulties in sourcing skilled labour. 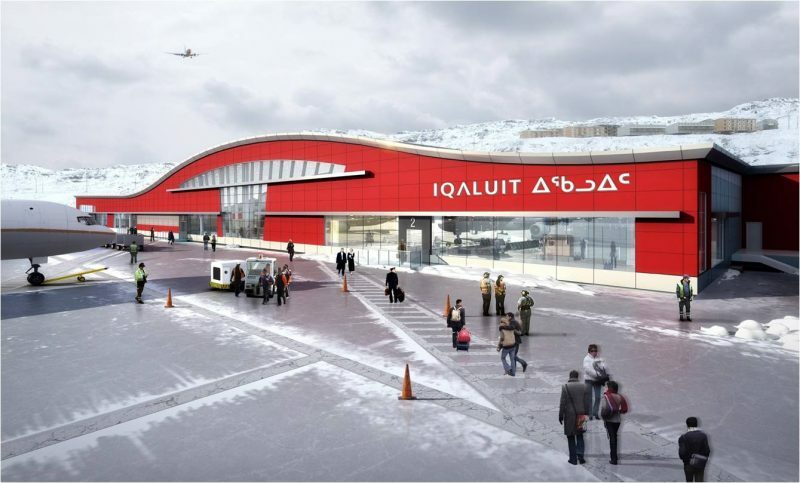 A lot of these projects were procured through Design & Build, some were also fast-track projects with challenging accelerated programmes, while others were for private and/or public owners, investors, and some were part of a Joint Venture like Iqaluit Airport. Each of them had their own unique character and I consider myself fortunate to enjoy such a wide variety of work. Architect’s impression showing the terminal building as seen by departing passengers approaching from the car park. 5. Given the location and extremes of weather in Iqaluit, often reaching as low as -45C (-50F), the partnership was clearly prepared to accept a high risk appetite for the airport project. How did you deal with this during work? As we do for all our projects at Bouygues, and particularly with this kind of work, we plan our works carefully, from the very beginning until the end. We build flexibility into our plan and we closely monitor our works allowing us to rectify any deviation. By works I mean not only construction, but of course also design, procurement, logistic, labour, subcontracts, testing and commissioning, handover and warranties. The Iqaluit Airport is a fast-track project with an accelerated programme, but we are used to it. That said, we were careful not to underestimate the challenges and extreme conditions we have been, are, and will continue to face throughout the project until its completion. We organised and phased our works by working seasons. This time duration varies a lot depending on the kind of construction activities, and the weather conditions though. For example; foundation works carried out outside in entirely exposed conditions can only take place during a few months of the year in somewhere like Iqaluit. After that superstructure works can run for slightly longer and only after the building’s envelope is secured, water and air-tight can the working season then continue for almost all of the year inside. However we do have to close the site for the coldest period of the year, for a few weeks over Christmas and January. The other big challenge on this project has been logistics and the procurement of materials for construction. There are only three boats trips available for sealift in a year. Depending on weather conditions, the first one can arrive as late as early August and the last one may leave Iqaluit as soon as early October. That gives a window of less than two months to schedule the receipt of almost all the materials the project needs for the year. If you ‘miss the boat’ then you miss the construction season, with dramatic consequences for either progress against the programme or for costs, as airfreight transportation is very expensive and limited to only some types of construction materials. 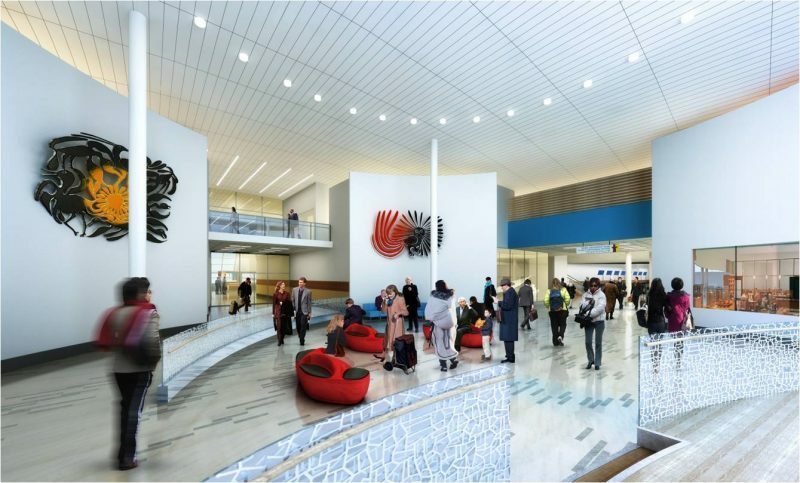 The architect’s proposals for the interior of the proposed terminal and the departure gates. 6. With $300 million being invested into the expansion of the airport, it stands to be the largest capital project in the territory’s history. Do you feel that it evidences an increasing interest by Ottawa, state governments, or Public Private Partnership (PPP) in the Arctic region? Obviously, I cannot answer on anyone else’s behalf, but I do sense that there is a tangible and growing interest in developing the Arctic region, particularly for the Nunavut Territories with Iqaluit increasingly seen as a hub. If this were not true, then why build a new international airport with far bigger capacity and with scope for significant future expansion? Whether PPP will be part of future developments is difficult to say, but for any such solution to be viable, it has to demonstrate the need for long-term services that provide value for money. That said, the Iqaluit Airport project shows that both Federal and Territorial Governments may well consider using the PPP mechanism again for Arctic projects in the future. 7. This is also an ambitious project, and one that projects confidence about growing Arctic tourism and travel. Do you think we are likely to see similarly ambitious Arctic projects emerging in the future? I think that the airport scheme is highly unlikely to be a standalone scheme in the region. The Arctic is a huge area where moving people and goods is, and will continue to be, both a priority and a challenge. Certainly in Nunavut the region aims to develop itself, so the airport project can be seen as a crucial means to help achieve that. This will hopefully also be followed by the construction of a new deep water port in Iqaluit which will improve supplies and logistics for Iqaluit and other Nunavut communities. The airport project and potential future projects will be a real step forward for the region in terms of increased tourism and economic/business travelling to the region, both of which in my opinion have a great future ahead of them. 8. What stakeholder and community engagement was undertaken during the development of the airport scheme? This is very important topic for us at Bouygues. There was a clear commitment during both the construction and operational phases of the project to involve the community and more specifically Nunavut Land Claims Agreement Beneficiaries. This engagement covered the terms of business and construction, as well as labour training and apprenticeships. This was not only a contractual obligation, which if reneged would penalise the partners financially, but it is included in Bouygues’ own corporate policies to develop local skills and businesses. This will bring added value to the region with more experienced, trained and accredited labour, will help grow the local economy and attract further investors. An architect’s impression showing the arrival hall interior. 9. How has the build offset its carbon footprint and demonstrated compliance with environmental building standards? Well, compliance with the Leadership in Energy and Environmental Design (LEED) certification was a requirement for the project. However, we didn’t just limit ourselves to the terms of the certification, but we instead targeted the LEED Silver award. Although aiming for this higher level will certainly be a challenge for us to obtain, largely due to the award scheme’s scoring mechanisms that promote local suppliers and penalise the carbon-costs of long-distance supply chains. The airport sits in a very remote location; there are significant transportation distances for certain materials, and there are a limited quantity and variety of local suppliers in the area, so we have had to work hard to overcome these challenges and find economies elsewhere. In addition to the certification, Bouygues have also committed to very tight energy consumption on this project, and our target during the operational period is considered critical to the project’s success. This represents a risk for us as a business, but this kind of commitment is becoming increasingly commonplace in the world of development, and so we are aiming to showcase our commitment to lower-energy consumption, as well as environmentally-respectful and sustainable techniques and methods of construction, not only in Canada but across all the five continents in which we work. 10. What is the wider economic benefit of this scheme and the airport expansion? Firstly on the micro scale, the Public Private Partnership was most probably the most suitable route for this undertaking. The total cost of the 30 year Project Agreement through the PPP procurement route will be significantly lower than it would have been using a Design-Bid-Build approach, and that has obvious benefits for the Government of Nunavut and for Canadian taxpayers. Then secondly at the macro scale, in order to better understand the economic benefit of the airport expansion, we must remember that Iqaluit, as capital city of Nunavut, has no access by road and the access by boat is very limited during different seasons. The territory itself is also composed of many islands and communities, which also have no access by road, and often where the local airport is the only point of access. That makes airport infrastructure absolutely vital for the Nunavut territories and its people. In the last decade, traffic at Iqaluit International Airport has increased by 5% every year and it is projected to continue to do so, or to grow further. Nunavut’s expanding population, increasing tourism and all the anticipated industrial developments have rendered the current airport under-provisioned and unable to accommodate the increase in air traffic. This makes the improvement of Iqaluit International Airport crucial for the economy of the city and the territories; by expanding capacity, it will attract investors and tourism to the region. An airport is generally the gateway to a city, and this is especially true of Iqaluit. Also in line with this, the new scheme has been specifically designed to allow for the future expansion of the airport with a minimum of disruption and costs. 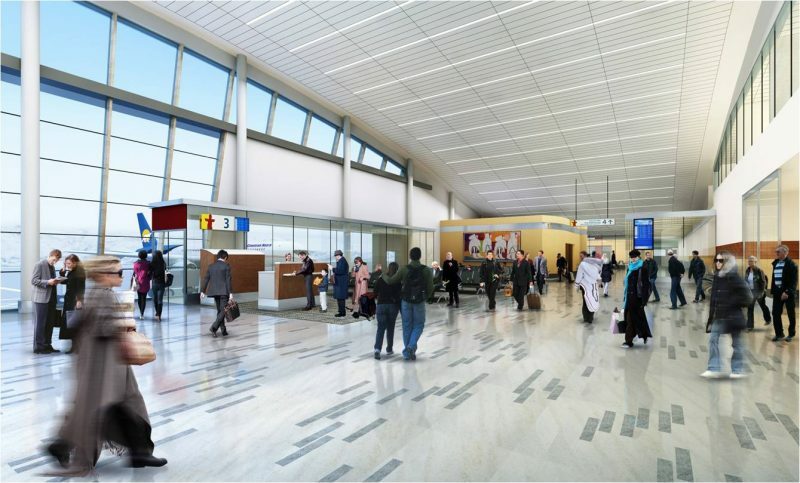 Space has been allocated for future increases in the security zones, gates, and baggage claim area, all while maintaining the configuration and functionality of the terminal. In addition to economic benefits, safety and security issues are becoming more and more challenging with the increase of traffic. So, with the new airport, travellers will be offered drastically improved conveniences when travelling to and from the city. Finally, let’s not forget that Iqaluit is at the intersection of both North Atlantic and polar routes, so it is and will continue to be a strategic airport for technical support stops, as well as emergency, technical or medical landings. 11. The procurement of the airport is being facilitated by a Joint Venture (JV) between Bouygues and Sintra Inc, who specialise in roads and infrastructure, along with Winnipeg Airports Authority (WPA). The scope of works is also the ‘full spread’: Design-Build-Finance-Operate and Maintain for a duration of 30 years. Can you elaborate a little on what led down this particular route? And how is the partnership progressing? This particular procurement route is simply the natural outcome for the realisation of such a challenging project. Bouygues has had great experiences with Joint Ventures and it can be considered as a leader in creating these kind of partnerships. With the Iqaluit Airport Scheme, it has found reliable partners to ensure the success of the project. Sintra Inc, is an independent part of Colas Group, which is in turn an arm of the wider Bouygues Group, and they are in Joint Venture with BBC for this project. Furthermore Sintra have demonstrated their skills in managing large-scale civil and infrastructure projects, something that has been key to the success of this Design & Build project. In addition to this, Winnipeg Airport Authority, with whom we have collaborated before, are also a well-recognised airport service provider in the North of Canada, and so they became another natural partner. I would say that to date all our partnerships have been progressing very well overall, and I am confident that it will remain that way until the completion of the project. 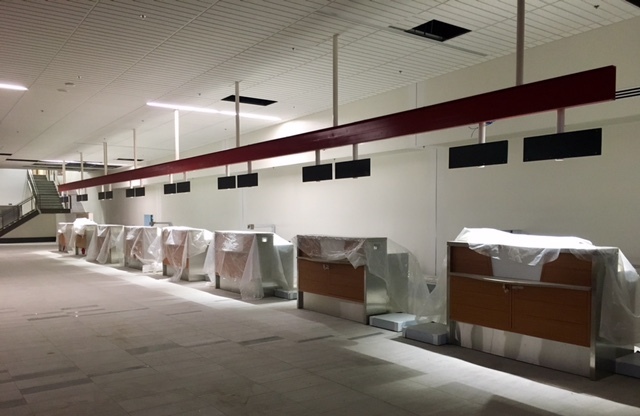 A site progress photo from January 2017 showing the new check-in desks being installed. 12. EFLA Engineers recently unveiled their latest designs for foundations that can combat the construction risks of permafrost. Were there similar considerations reflected in the design and specification of the Airport improvements? For both Air Terminal and Combined Services buildings in the airport, which stand on large areas of tundra ground, we have opted for the dynamic thermosyphon technique that allows us to ‘freeze the ground’ under the building all year round, allowing a simple concrete slab to sit at grade (flush with ground level) without necessitating a heavier work involving driving concrete piles deep through the soil down to the ‘harder’ permafrost layers. This saved a lot of time, money and materials. We were able to achieve this by excavating the upper layers of the soil, which in Iqaluit is not permanently frozen for the entire year. So, we were able to use these non-frozen layers of earth as ‘backfill’ under the building, then ensuring proper insulation and waterproofing membranes between the building and this backfill. With this complete, we could then ‘permanently freeze’ that earth underneath the building by using the thermosyphon system to passively cool and harden the ground, thereby maintaining its structural integrity for bearing the building’s weight all year-round. A network composed of vertical and horizontal loops of temperature sensors also allows us to monitor this underground area throughout the building’s life to ensure that any rises in global temperature in the future do not affect the functioning of this passive heat exchanger system and, in case it does, to compliment it with a more active heat exchange system, and this is exactly what makes our system unique compared with most of the thermosiphon technology commonly used in the Arctic. 13. Were there any other innovative construction techniques that you tested or used during this project? Another creative technique that was used was the installation of Combined Heat and Power (CHP) units to produce the largest share of the electricity for all the airport buildings. This CHP system uses the heat created by burning locally available fuel to heat and power the building. Since we had committed to a very challenging energy target, we had no other choice than to look for low-energy techniques. In responding to this, these CHP units happened to fit very well with this kind of project where buildings need to be heated for the largest part of the year and could do so more sustainably than by relying on conventional power sources. These CHP units are also controlled by a complex Building Management System in order to optimise and control the energy consumption to satisfy both electricity and heating demand in both buildings, preventing waste and improving our sustainability. In addition to this, in order to closely control the energy consumption of the building and directly link into the Building Management System, we have added a very sophisticated ‘Measurement & Verification System’ as well, one with hundreds of measuring points and performance indicators monitoring Kilowatt-hours, fuel, air and water flow, which will allow us to keep track of not only the energy consumed in the building but also how it is consumed. If this system follows the design parameters, it will also allow us to correct instantaneously any case of deviation of waste, whether due to a technical issue or human error. Site photograph showing the terminal gates currently undergoing an internal fit-out. January 2017. 14. The airport will serve both the Canadian military and civil aviation. Balancing these conflicting demands in one facility will have been difficult, especially given the differing requirements, as well as the shared runway. Can you elaborate on how you tackled this? Indeed, this airport will and already does serve both military and civil aviation. However, the military facilities are outside the remit of the airport construction, and we have had no involvement with it except for the runway itself, which is shared. As I mentioned before though, both the airport and runway never ceased operating throughout all phases of the construction, so there were many complex coordination issues to work through in the phasing. The Canadian Military Aviation were just another user of the airport facilities, and so they were engaged early on and we have cooperated with them throughout the construction phasing and the build. 15. On the 5th of September, 2015, the airport’s roof caught fire. Fortunately, no one was injured, but this was clearly a setback for the project. How did you deal with that and minimise the impact on the project programme? Indeed, this was also the last working day of the subcontractor working on the roof insulation, and they left the roof before ensuring that temperature had decreased below an acceptable level. This led to the consequence of a fire, in which fortunately, no one was injured as you say. We also managed to react as planned for this kind of event. The fire was extinguished, and after all staff members had been accounted for, Bouygues then immediately advised the project’s insurers and proceeded to implement mitigation measures to avoid more damage to the building, and to prepare as best we could for the winter. It was by this stage too late to proceed with any remediation works due to the weather conditions that would have jeopardised other construction activities in and outside the building. So instead, we waited until the next season to begin this work, and by doing so, as well as by bringing on more construction staff, we have been able to keep to the original construction schedule. The remediation works took place during the summer of 2016, along with all necessary tests, supervision and checks, so today the roof and the rest of the building are as if the fire had never happened, so we are quite pleased. Architect’s impression of the terminal building as seen by passenger arrivals from the runway. 16. Finally, once this project is completed in September 2017, what is next for you? That has always been a question which goes unanswered until shortly before I complete a job. This is evidenced by the fact that I have worked in several countries and continents within just the last few years. Sometimes the answer emerges just a few weeks before I finish a project, or sometimes a few months before, it depends. I also accept that this could be construed as chaotic, but I have learned to embrace it as a part of what I love to do, even if that makes organising my personal life a little bit more complicated! What is sure, however, is that my next mission will probably bring me a brand new horizon and, as always, a very short period of time to get myself familiarised with the place, culture, working environment and project itself. This new horizon is, I think, what I enjoy the most though. Moving to a new and dynamic country, seeing a new and growing economy, getting to know people, and working on projects with a real ‘purpose’ are some of the characteristics which I consider as critical criteria before I agree to engage in a project. That, and something that offers me more of a challenge than the last, which is always welcome! Olivier Walon is a Project Director for Bouygues Bâtiment International, a development arm of the Bouygues Group. He has more than 15 years of experience in the international construction sector, having managed and delivered projects in Asia and Europe, as well as Central and North America after developing a reputation for leading and delivering the most complex and challenging projects. Olivier is currently managing the delivery of the Iqaluit airport scheme, a $300 million redevelopment of a remote Arctic airport which serves much of Baffin Island and Frobisher Bay in the Canadian Province of Nunavut. Originally from Belgium, Olivier studied Electrical Engineering at Université Libre de Bruxelles and then at Universidad Politécnica de Madrid before beginning his Bouygues career in 2001 in the mechanical and electrical domain. He moved into Project Management in 2012 and rose to be Project Director in 2013. He has extensive experience in a range of sectors from public and private, to tertiary, industrial and infrastructure projects. Owing to his international experience Olivier works fluently in several languages including English, French and Spanish, along with working proficiency in Dutch and Portuguese. Thomas Bishop is Unit Lead for the Built Environment Unit at Polar Research and Policy Initiative. Thomas is a creative and independent thinker, built environment professional employed by WilkinsonEyre Architects. For further information please visit his profile here.